Recently I was asked to use XenDesktop 5 as a way for students in a developer training class to connect to individual Windows 2008 R2 server VMs. I agreed to set it up, but forgot that the Virtual Desktop Agent (VDA) will not install on Windows 2008 R2 server, because the installer blocks it. I did some searching on the web and came up with a post by Carlo Costanzo talking about installing the VDA on Windows 7. This post made me realize the agent was capable of running, but simply wouldn’t install because it KNEW I was trying to put it onto Windows 2008 R2 server. After some more searching, I found a post in the Citrix forums by a guy named Patrick Suddereth, who had managed to install the agent onto Windows 2008 R2 using a TRANSFORM workaround. His post is here. 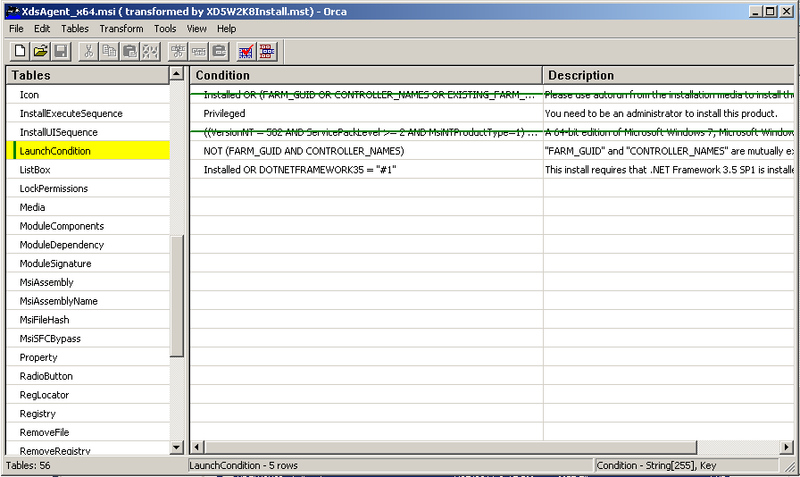 So, I downloaded the Microsoft Windows SDK and installed a sub-component called Orca on my Windows 2008 R2 dev box. This program allows you to edit the installation process of a MSI file, then generate a .mst (transform) file. A transform file simply tells the installer what to do differently from the default installation. In this case, we needed to remove the prerequisite check of the OS (and as I found out later, allow the MSI to be installed directly). Made the edit directly to the agent MSI (instead of using the transform) and saved it back into the copied directory. Did a right-click / Run as Administrator to open a Console window. Ran msiexec /i XdsAgent_x64.msi at the command prompt. The agent installed successfully and the system rebooted as expected, but the machine refused to register with the XenDesktop 5 Controller. I tried turning off firewalls, restarting services, still nothing. Then I found a reference to a registry key that turned out to be missing! Add a String (REG_SZ) called ListOfDDCs and for its value put the fully qualified name of your XenDesktop 5 server (like foo.bar.com). Go register your machine using the Desktop Studio and it should connect immediately. NOTE: I’m sure this is not supported by Citrix in any way, so use at your own risk. • %Program Files%\Citrix\ICAService\picaSvc.exe requires inbound TCP on port 1494. Because this connection uses a kernel driver, you may need to configure this setting as a port exception rather than a program exception, depending on your firewall software. If you are running Windows Firewall, you must configure this setting as a port exception. Special thanks to Jerry Jaworski for figuring this out and submitting it!